Dear Traders, Followers and Friends! Are you ready for another mind shifting webinar? It is better you are because next week, Thursday October 16th, 2014 I am going to offer a new belief-changing type of webinar, packed with information that has the potential to change the way you think about trading, forever. That’s what Participants of my FibStalker Methods Coaching Program are already saying. “And FYI I caught the measured move short on S&P DOW & DAX so I paid for the class already……..”, R.M. “The discussion was thought provoking”, G.S. “I want to tell you that I’m very happy for the decision I’ve made as for my participation to your coaching class and of course for yours too for accepting me in.”, P.T. “The first impression I have from the webinar on Saturday, is mildly stunning.”, P.T. “The rules based trading system, website and mentoring program design are impressive and show a enormous amount of thought, work and preparation.”, G.S. “I am to the least thrilled for what it is coming next!”, P.T. “I know quality when I see it and I can tell that you offer value that is off the charts.”, G.S. “I am not sure that earlier in my trading career I would have recognized that there was both more information to go back and review and more information to anticipate in the future”, G.S. The title of the webinar is “A New Philosophy for Trading Success in Modern Markets“. How badly do we need that? Well, if we look at the results of the average trader, as well as the majority of traders, I would see we are much in need for new and effective ways of analyzing, reading and trading the markets differently. Actually, over 90% of traders lose consistently in the markets. So doing things differently is key. And this is not ‘face value’ but a substantial change. And not something we can do without looking at the reality of modern markets. What I mean here is that I have not been looking just at another way of generating statistical data tables of past price behavior through the filters of a newly created indicators. I leave that to new traders and inexperienced market students who believe that reaching consistency in the market is easy and it is just about finding the good formula. I continuously warn them that is not the way to go. What I mean instead is to find ways of reading price that are grounded in the way the markets work. There are only few things that can be proven or are true about the markets. One of these is the existence of algorithms working on all timeframes, in high volume markets. Can we leverage on that and obtain a significant edge out of that? Yes we can. And anyone can once the rules to model effects of algos on price are known. I will talk about this and other aspects of my philosophy of trading. Have a look at the summary of this webinar. 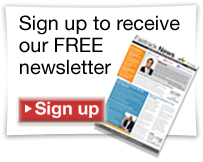 If you want to look at the quality and impact of what I talk about in my webinars you may also want to have a look at the other ones I have already offered on FXStreet.com. And I promise that they are though provoking and you will find information that has the potential of changing the way you think of price and trade, for the better. Hope you enjoy and, as usual, I am happy to receive your comment. Just leave a post below and send an email to me. 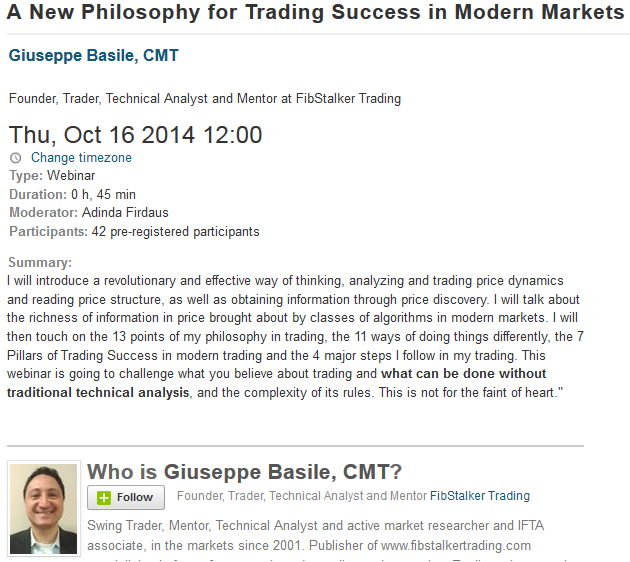 We’ve brought in Analyst Giuseppe Basile, CMT, for an exclusive almost 3 hours webinar! This is a two part series and that will be on Thursday, June 19th. 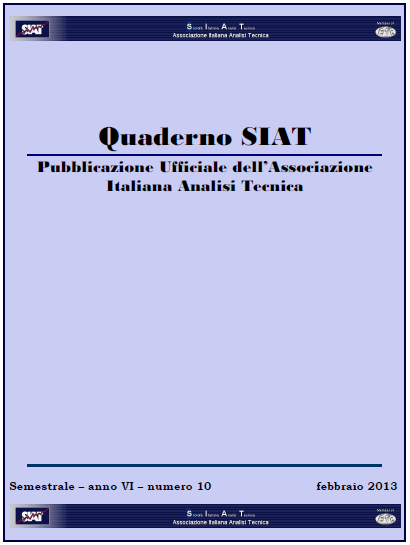 In “Thinking and trading like modern algos” and “How “secretive” program trading incorporates market psychology”, Giuseppe Basile will show us a major class of algos that strongly influences modern market and the “invisible” Program Trading. The webinar is made of two parts: the first part is open to all users for free and the second part is for Premium users only. In the first part of our Monthly webinar, we will look at how forex market price moves and compare to how the average trader thinks the market moves. We will then turn focus on Program Trading, a major class of algos that strongly influences modern markets, and how we can model it. Finally we investigate the stages of a trader, what is trading all about and choosing consistency and risk acceptance. In the second part of the Monthly Webinar, we review a simple, but very effective setup CME floor traders brought into computer-based trading in the late 80s. Then we will focus on the “invisible” Program Trading, that silently adapted to mimic market psychology and I will show jaws dropping long-term charts that show how the rules used by Program Trading could be applied in the last 110 years. Those same rules can put you in the elite 5% of regularly consistent winners. * FXStreet webinars are run using Webex. If it’s the first time you attend a webinar on FXStreet, we recommand you to read our instructions.